I earned my first tie score in LearnedLeague yesterday. Considering that this was my 20th match of the season, that’s remarkable. Ties are relatively common in LL. (At the Championship level, in fact, ties are almost as frequent as wins and losses, since the majority of the players on any given day will answer all six questions correctly.) My first tie kept me solidly in second place in my Rundle or bracket, behind (coincidentally) my opponent in this particular match. Want to play along? Here were the questions for Match Day 20. Answers will follow below. Question 1: Johannes Brahms’s Opus 49, No. 4, which he titled Wiegenlied, is most widely known today in English by what name? Question 2: Identify the country in this photograph. Question 3: Kix and Ronnie are the first names of what country music duo, who had a total of 20 number one and 39 top ten hits on the Billboard Hot Country Songs chart before splitting in 2010? Question 4: The Baltusrol Golf Club (seven-time US Open host and 2005 & 2016 PGA Championship host) and the Pine Valley Golf Club (which frequently tops lists of World’s Best Golf Courses) are both located in which U.S. state? Question 5: In the history of the Oscars, the only film to receive four acting nominations for women is 1950’s All About Eve (two for Best Actress, two for Best Supporting Actress). Name any two of the four women who received these nominations. Question 6: This is a screenshot from what popular (and seminal) video game? I’ll give you a moment to jot down your responses. All righty then. Here’s the answer key. Answer 1: I thought this was about as close to a “gimme” as LearnedLeague offers. Even if you know nothing at all about classical music in general, or about Brahms specifically — and if you do, I don’t know an awful lot more than you do — you’re probably familiar with the piece commonly called “Brahms’s Lullaby.” Indeed, I suspect that for most people, “Lullaby” is the first word that springs to mind upon hearing the name Brahms. You might not know that this familiar ditty is formally titled Opus 29, No. 4, or that Brahms referred to it as Wiegenlied (“Cradle Song” in German), but if I said, “Name a musical composition by Brahms,” I’ll wager you’d guess “LULLABY” if nothing else came to mind. I did, and was correct in so doing. Answer 2: Picture clues are among the most difficult, because often you either recognize the image immediately, or you don’t. There are probably ways to suss this one out — it’s a black-and-white photo, which might suggest age — but I’m betting that if you got this one (as did my opponent), it’s because you recall seeing this picture before. 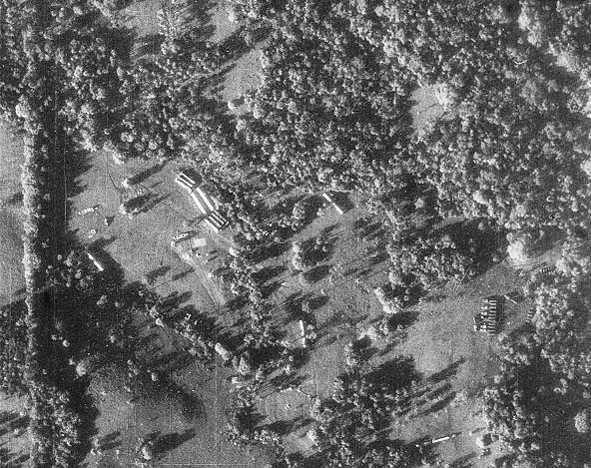 If so, you recognized it as one of the photos used at the height of the early 1960s missile crisis to purportedly show where the Russians had installed nukes in CUBA. I, on the other hand, didn’t find it familiar, so I took a random stab that it might be an aerial shot of the compound where Osama bin Laden was taken down, and answered Pakistan. Answer 3: Regular visitors to this site know of my unrepentant antipathy toward country music, a term which I contend is an oxymoron. Still, I do own a television, so I’ve at least heard of most of the more popular artists in that genre. Besides, if you run across a guy whose parents named him after their favorite breakfast cereal, you’re probably going to remember that. The name Kix led me straight to BROOKS & DUNN. Although I’ll admit that until reading this question, I was not aware that Brooks & Dunn were now Booked & Done. But now I know. Answer 4: Like classical and country musics, golf is not among my areas of expertise. I only care about the game when Tiger Woods is in contention and the Giants aren’t on. Speaking of Tiger, one of the more notorious incidents in his career (before we knew he was picking up waitresses at the Waffle House, that is) occurred during the 2005 PGA Championship at Baltusrol. Tiger finished his final round on Sunday at two under par. Rain, however, stopped play in the early evening while several other golfers — notably Phil Mickelson (at the time -4), Steve Elkington and Thomas Bjorn (both -3) — still had multiple holes to complete. Apparently figuring that at least one of the three players ahead of him would hold score, Woods packed up his gear and went home to Florida on Sunday night, despite the fact that if Mickelson, Elkington, and Bjorn fell back when play resumed Monday morning, Tiger might be forced into a playoff — or might even win outright if all three completely tanked. Luckily for Tiger, all three played even the rest of the way. Mickelson won by a stroke, with Bjorn and Elkington one shot behind him and one ahead of Tiger and Davis Love III. If you remember that story, you probably remember that Baltusrol is in Springfield, NEW JERSEY. Answer 6: We all have bugaboos. You know, that word you just can’t spell correctly, even though you’ve written it a thousand times? Or that phone number you always miss by a digit, even though you call it all the time? Well, when it comes to video game history, King’s Quest and THE LEGEND OF ZELDA constitute a bugaboo for me. 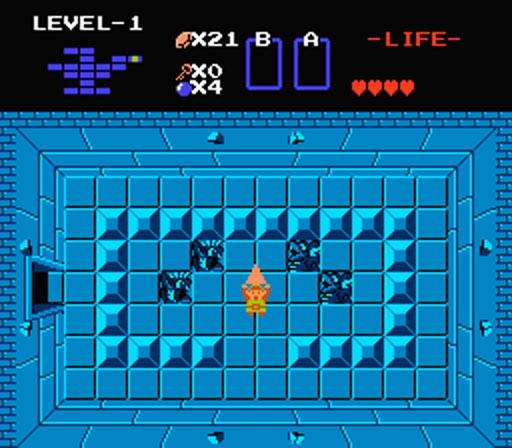 I can’t tell you how many times over the years the correct answer to some trivia question was “The Legend of Zelda,” and I blurted out “King’s Quest” instead. I’m not sure why these two games are so completely conflated in my memory banks, but they are. Here again, the bugaboo stung. I even challenged myself before I submitted my answers: “Are you sure this isn’t The Legend of Zelda?” “Shut up, fool! It’s King’s Quest! I know what I’m doing!” One of these days, I’ll learn. My esteemed opponent on this day answered five of the six questions accurately to my mere four, but we tied at 8 points each due to defensive assignment. His one miss was on a question I had assigned one point (Question 5); my two misses were questions he’d given one point and zero, respectively (Questions 2 and 6). This demonstrates how it’s possible in LearnedLeague to tie or even lose on a day when one’s opponent nails fewer right answers. Defense is all — well, almost all — in LL. Someone — I believe it was Rod Stewart — once said, “Every picture tells a story, don’t it?” I don’t know whether that’s true of every picture, but it’s certainly the case with this one. I picked up this pencil sketch of Wanda Maximoff, the Scarlet Witch, from an art dealer at WonderCon in February 2005. Drawn in 1992 according to the signature — and signatures never lie — it’s the work of the great Bob McLeod, who created the very first piece of custom art I ever commissioned, a gorgeous pinup of one of my favorite heroes, the Black Panther. That’s one reason I was so excited to find this sketch, which shows Bob’s fine grasp of expression and anatomy to perfect, unvarnished advantage. The other reason was that I thought it would be fun to have Bob revisit and complete the drawing thirteen years after he began it. So, a few days after I purchased it, I packed the sketch off to Bob. Below, you see the finished art, vintage 2005. Dramatic, huh? Yes, believe it or not, both of these pictures are scans of the exact same physical piece of art, scanned (about four weeks apart) at two stages of its development. Not only can you see the amazing change a comic art drawing undergoes from its pencil origins to camera-ready inks, but you can also get a sense of the way one artist’s personal style evolves over the course of several years. In comparing the two versions, Bob McLeod joked that the Scarlet Witch appears to have shed about 30 pounds between 1992 and 2005. I wish it were that easy to lose a few, by means of a handful of brush strokes and a strategically applied eraser! Let’s review the set of questions that wrought my first crushing defeat. Question 1: The 2003 Pulitzer Prize-winning Master of the Senate, by Robert Caro, is the third volume of a mammoth biography of what American? Question 2: The 32-song soundtrack to what film, released in July 1994 and filled with American artists such as Elvis Presley, Jimi Hendrix, The Mamas & the Papas, Bob Seger, and Aretha Franklin, peaked at #2 on the Billboard chart, and was ultimately certified 12x platinum by the Recording Industry Association of America? Question 3: The only blemish in what thoroughbred racehorse’s 21-race career was a place at the 1919 Sanford Memorial Stakes in Saratoga Springs, New York, behind a horse named, appropriately enough, Upset? Question 4: The scientific field of nuclear physics was born, one could argue, in 1896, when radioactivity was discovered by what Frenchman, for which he shared the 1903 Nobel Prize in Physics with his doctoral student Marie Sklodowska-Curie and her husband Pierre? Question 5: Name the democratically elected Prime Minister of Iran who was ousted in August of 1953, in a coup d’État orchestrated by intelligence agencies of the United States and United Kingdom. Question 6: What is the most common term in mathematics for the type of number that is the sum of a real number and an imaginary number, typically expressed as x + iy, where i is the square root of negative 1? Okay then, let’s check them off. Answer 1: A fair chunk of my pleasure reading consists of biographies. Although I’ve never read any of the books in Robert Caro’s series on President LYNDON JOHNSON, I’ve certainly heard of them. Caro is probably one of the three or four best-known biographers of this era, and he’s won pretty much every award that one can win for writing such books. Although, why anyone would want to write four thick volumes about LBJ (with a fifth and final still to be published) is beyond me. Answer 2: I have a difficult time remembering numbers — I have to look up our home phone number every time I order a pizza — but the two categories of numbers I do well with are the sequence of U.S. Presidents and the release years for movies. The key to this question is the year the film was released — 1994. The two biggest Hollywood hits of that year were Disney’s The Lion King, whose soundtrack consists of several now-famous show tunes written by Elton John and Tim Rice, and FORREST GUMP, whose soundtrack boasts a wealth of classic rock songs. Clearly, the latter was the correct response here. Answer 3: Here’s another of those questions for which The Daughter, a horse-racing aficionado, would never forgive me if I didn’t know the answer. It’s also a familiar etymology factoid. One of racing’s most legendary horses, MAN O’ WAR, lost his only match against a little-regarded challenger named Upset. Prior to this event, the word “upset” only meant “angry” or “irritated.” Afterward, sports fans started referring to an overwhelming favorite’s loss to an underdog as “pulling an Upset,” and the word gained a new meaning — one that’s almost as common in usage today as its original ones. Answer 4: This is where the first wheel fell off for me. I know about the Curies, of course — Marie Curie remains to this day the only individual to win Nobel Prizes in two different fields of science. (A frequently handy nugget of trivia, that.) But the name of her mentor? I hadn’t a clue. After assuring myself that this snippet of information wasn’t in my memory banks anywhere, I typed in the name of the only French scientist from the relevant time period that I could think of — Louis Pasteur. Yes, I know Pasteur had nothing to do with radioactivity, but at least I filled in the blank. My esteemed opponent, conversely, had no difficulty in coming up with HENRI BECQUEREL, whom I might have thought invented one of the mother sauces in French cuisine. Answer 5: There’s only one reason I knew this. Just last weekend, the Pirate Queen and I finally got around to viewing Argo, the reigning Best Picture Oscar winner. Without that very recent hot dip into modern Iranian history, I’d have never known that the Shah’s predecessor was the duly elected MOHAMMAD MOSSADEGH. I still didn’t know how the man’s surname was spelled, but the Commissioner of LearnedLeague took pity on me and gave me credit for a correct response despite the mangling. Answer 6: I probably shouldn’t admit this in print, but my future opponents will quickly figure it out anyway: Math is not my element. I need the calculator on my iPhone to figure out the tip on a restaurant check. Algebra and other higher mathematics? Please. When I see a question with an equation in it, like this one, my eyes glaze over. I put down one of the terms floating about randomly in my skull — irrational number — which proved to be incorrect. (I felt better after learning that my response was the most common wrong answer to this question. At least a number of other players knew as little about math as did I.) My esteemed opponent, who apparently has no gaping holes in his knowledge base, accurately identified the correct answer as COMPLEX NUMBER. Me, I only have a complex about numbers. What was the name of the British one-hit wonder whose song title I parodied in the heading of this post? The first person to answer correctly in the comments wins… well… nothing material. But I’ll give you my undying admiration, which you’ll have to admit is priceless. One of the most legendary origin stories in comics — an industry fraught with legendary origin stories — is the one about the Silver Surfer. Not the origin story of the Surfer in Marvel Comics’ fictional universe, but rather the origin of the character in the all-too-real world. Cognoscenti will recall that in the Silver Age (the roughly 15-year period from the mid-1950s until around 1970), Marvel’s output was scripted via what came to be known as “the Marvel Method.” Instead of giving the pencil artist a complete manuscript from which to draw the story, the writer — usually Stan Lee, in those days — would instead provide a more general outline that might range from a few paragraphs (or even a few sentences) to a mere list of plot points. The artist would develop the visual story however he deemed fit. When the pages were completed, the writer would then fill in dialogue and captions that suited whatever the artist had drawn. This often meant that the writer had little clear idea what images would appear on those pages when they came off the artist’s table. When Lee received from artist and co-creator Jack Kirby the pencil art for Fantastic Four #48, famous today as the first book in the three-issue arc that introduced the cosmic supervillain Galactus, he was surprised to see that Kirby had drawn in a character riding a flying surfboard. Kirby explained that he thought Galactus — a gigantic, supremely powerful humanoid being who consumed planets to ingest their energy — needed a herald, someone who would warn the denizens of worlds in Galactus’s path to prepare for their doom. After some initial reluctance, Lee wrote the character into the story. Later, the Surfer became a major point of contention between Lee and Kirby, who each had radically different ideas about how the Surfer’s persona and back-story should evolve. As I’ve intimated in previous Comic Art Fridays, I tend to be a Marvel Method scripter when it comes to my commissions. Typically, I give the artist the barest of instruction — no more than the names of the character(s) to be depicted, in most cases — and allow him or her free rein to draw whatever pleases their creative sensibilities. Therefore, I’m always at least a little bit surprised by the finished product. And on occasion, like Jack Kirby and his Silver Surfer, an artist completely startles me by including an element in a drawing that I never expected to see. As you can see in the image above, Geof’s equine illustration is impeccably detailed and astonishingly accurate. How many comic book artists can draw a horse that well? When I asked Geof why he’d gone to all that extra (and uncompensated) work, he said simply, “She (Valkyrie) just didn’t seem complete without him (Aragorn).” Of course, he was correct. Later that same year, I commissioned an artist named Scott Jones — who frequently signs his work “Shade” — to draw a Common Elements piece featuring Liberty Belle, the Golden Age heroine most closely associated with the All-Star Squadron (and, in her present-day incarnation, the Justice Society of America), and an obscure character from a now-defunct Webcomic, Liberty the American Girl. Once more, I was blown away when I discovered that Scott had included yet another figure in his drawing, none other than the Statue of Liberty herself. As I had with Isherwood, I asked Scott why he added the additional figure (which, again, is painstakingly accurate and beautifully detailed). His response mirrored Geof’s: “A Liberty-themed scene just wouldn’t have been complete without the Statue of Liberty in there.” And of course, Scott also was correct. Artists who take on commission projects almost always quote additional fees beyond their typical charges when called upon to add backgrounds or extra characters. And well they should — artists deserve fair compensation for their work, and more work merits more pay. I support that principle wholeheartedly. As someone who routinely commissions multiple characters for my Common Elements themed pieces, and specialized design work for my Bombshells! pinups, I always expect to pay an artist more when I request these items. But I’ve been pleasantly surprised on numerous occasions by artists whom I’ve paid for a simple one- or two-character drawing, who have thrown in a detailed background — or even another character or three — without asking for another dime. Why do they do it? Because they just can’t let the art their drawing tables until they’re satisfied with the product… and it just needs that extra something. I hope I always remember to say thanks.